Revitalised by the arrival in late summer of former Bellmans chief Jonathan Pratt as managing director, Dreweatts is preparing for two key auctions at its Donnington Priory saleroom this week on November 21 and 22. First up is Dreweatts’ Fine Furniture, Carpets, Ceramics and Works of Art on Wednesday, which includes a 16-lot private collection of furniture consigned by a London-based family. Talking to ATG at a busy preview day on Friday, November 16, head of furniture Ben Brown scans the sale's 277 lots and picks out a pair of George III satinwood and specimen marquetry folding card tables, made c.1790 in the manner of Mayhew and Ince. They are semi-elliptical in outline, “not ‘demi-lune’ as they are not a perfect half circle,” Brown points out. Each has a rosewood banded top featuring a vine and berry border opening to reveal a baize-lined interior. 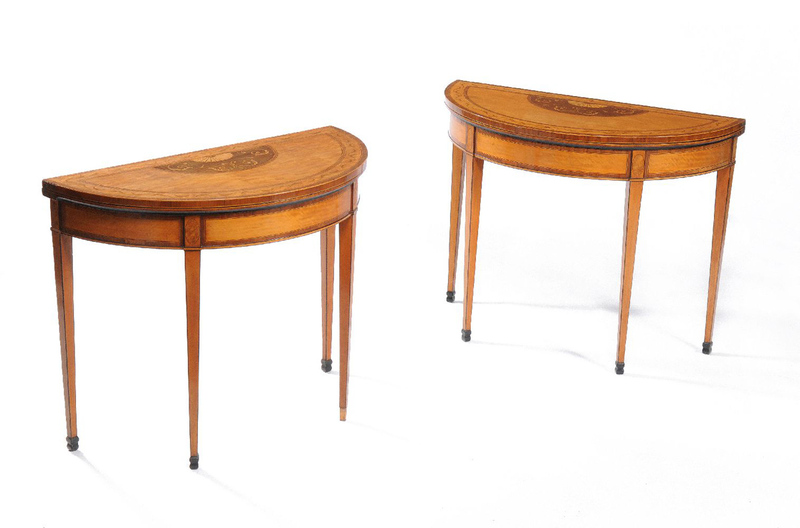 On square section tapering legs, the 291/2in (75cm) high, 37in (95cm) deep tables are estimated at £3000-5000. The lot can be viewed at thesaleroom.com. Brown said the marquetry work makes the pair stand out from similar card tables that have sold recently, including a pair that sold at Christie’s in May 2016 for £7500 hammer, and a detail of the marquetry features on the sale catalogue cover. One of no less than four drum tables in the Dreweatts sale is a George III, c.1780 large mahogany library table, featuring 12 drawers, six of them opening by a revolving action. With green leather inset into a 44in (112cm) top, the table carries what Brown calls “a sensible estimate of £5000-8000. It’s in pretty much untouched condition, which buyers love”. There are high hopes – and expectations – of the Fine British and European Sculpture sale on Thursday, November 22, only the second such sale for Dreweatts. “It was suggested by the board that we do standalone sculpture sales, as no one else in the regions are doing them,” said Dreweatts’ head of sculpture & European works of art Cristian Beadman. This next sale comprises 145 lots including Egyptian antiquities, through to Medieval Venetian Gothic and Tuscan Renaissance works, as well as pieces by modern British and European sculptors. The auction features a consignment of 15 sculptures from a private collector, with a promise of 15 more from the same source. Asked to highlight which objects are generating pre-sale interest, Beadman indicates one of the 15, an Auguste Rodin (1840-1917) patinated bronze cast of The Age of Bronze. The life-size bronze statue of a Belgian soldier Rodin created in 1877 is housed in the Alt Nationalgalerie in Berlin. The cast on sale at Dreweatts dates from the mid-20th century and is estimated at £2000-3000. “Those from 1880 are worth £250,000,” Beadman says, adding that "we think this one might make five figures”. Inscribed A.Rodin and Rudier Fondeur to the base, the cast is 40in (101cm) high on a base 11in (27.5cm) wide. 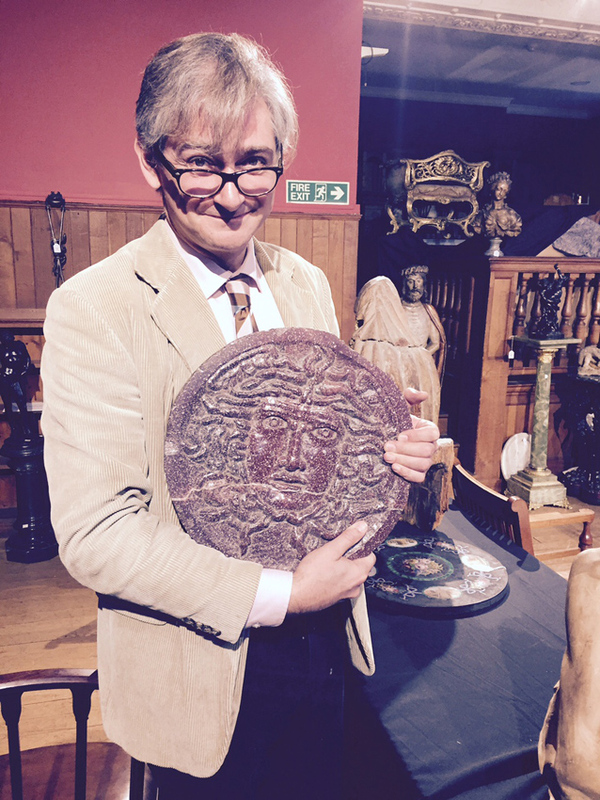 The sculpture sale catalogue cover star is a recessed relief sculpted porphyry roundel depicting the face of Medusa, late 18th century and thought to be a Grand Tour souvenir. “I love porphyry sculpture for its purple colour – I saw my first one of a Roman emperor in the Vatican when I was seven years old,” Beadman says. Estimated at £2000-3000, the catalogue notes that the portrayal here is in the manner of the more formally beautiful Medusas of the Hellenistic and early Roman period. The auction can be viewed at thesaleroom.com.